Popovers, as I’ve come to discover over the course of the year, are among the most underrated breads out there. Their airy, crunchy, and tender texture is universally appealing; but best of all, the elegant things could hardly be easier to whip up. 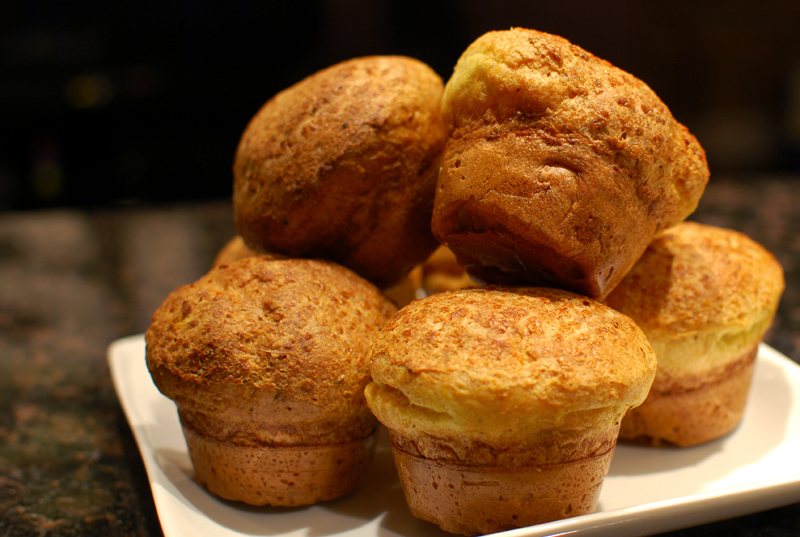 I mean this nearly literally: if you can whisk flour into liquid, you can make great popovers. Not “good”, mind you, great. Some may insist that the best popovers involve any one, or a combination, of the following: a one-hour (minimum) rest before baking, no rest before baking, a very hot oven, a cold oven, a very hot then moderate oven, a preheated pan, a cold pan, and/or a partridge in a pear tree. Truth is, I’ve used all those methods, and I’ve not noticed much difference with any of them. They’ll all produce equally good results – or equally bad results, if you open the oven door before the structure has set. Just use whatever you feel most comfortable with, or whatever matches your schedule best. But as good as a standard popover is, sometimes it can be a bit… plain. Sure, it’ll go with any food from here to next week, but every so often, you want something more. Rather than the agreeable, decorous nature a popover usually has, you want something a bit less genteel, a little risqué even. 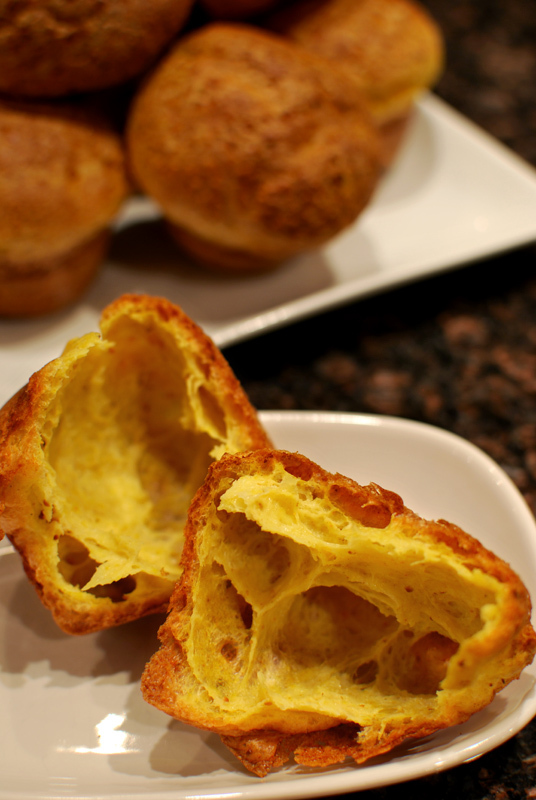 To liven things up a bit, here we have the deep smoke of cumin combined with the bright spice of curry powder, resulting in a popover that’s just as easy, just as soigné, but far more sultry. And though the flavors are far different, this variation still does as good a job at pairing with a wide variety of foods as their plain-Jane cousins. Picture serving a basket full of these, piled high. Break one open, and like a jewel box, you find the interior a stunning display of gold. The smell of cumin hits your nose, and you crunch through a bite. They’re not like any popover you’ve ever had before, but if new versions are all this delicious, you’d be willing to branch out a bit more often. And as easy as they are, you really have no excuse not to. 1. Preheat the oven to 375° F, and place a rack in the lower third of the oven. Generously grease six popover tins, or nine standard (1/2 cup) muffin tins. 2. In a small pan over medium heat, toast the cumin and mustard seeds until fragrant, 3 to 5 minutes. With a mortar and pestle, coarsely crush the seeds. 3. In a bowl, whisk together the eggs, milk, and water. Add the melted butter in a stream, whisking constantly. Add the flour, curry, salt, and ground cumin and mustard. Whisk until combined, but still slightly lumpy. 4. Divide the batter evenly among the prepared tins. 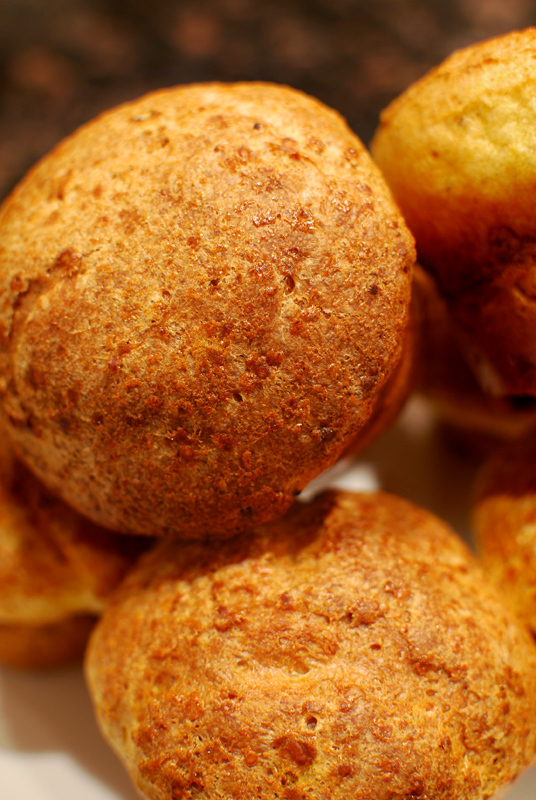 If desired, sprinkle additional whole cumin seeds over popovers. Bake at 375º F for 45 minutes. Using a small, sharp knife, cut a small slit about 1/2 inch long in the side of each popover to release steam. Bake for an additional 10 minutes. Remove from pan, and cool slightly before serving. 1. Popovers may be cooled completely, then wrapped well and frozen. Reheat in a 350º F oven for 3 to 5 minutes, or until warmed through.